Xamarin.Android supports several CPU architectures, including 32-bit and 64-bit devices. This article explains how to target an app to one or more Android-supported CPU architectures. When you prepare your app for release, you must specify which platform CPU architectures your app supports. A single APK can contain machine code to support multiple, different architectures. Each collection of architecture-specific code is associated with an Application Binary Interface (ABI). Each ABI defines how this machine code is expected to interact with Android at run time. For more information about how this works, see Multi-Core Devices & Xamarin.Android. Typically, you explicitly select an architecture (or architectures) when your app is configured for Release. When your app is configured for Debug, the Use Shared Runtime and Use Fast Deployment options are enabled, which disable explicit architecture selection. Typically, you explicitly select an architecture (or architectures) when your app is configured for Release. When your app is configured for Debug, the Use shared Mono runtime and Fast assembly deployment options are enabled, which prevent explicit architecture selection. armeabi – ARM-based CPUs that support at least the ARMv5TE instruction set. Note that armeabi is not thread-safe and should not be used on multi-CPU devices. armeabi-v7a – ARM-based CPUs with hardware floating-point operations and multiple CPU (SMP) devices. Note that armeabi-v7a machine code will not run on ARMv5 devices. arm64-v8a – CPUs based on the 64-bit ARMv8 architecture. x86 – CPUs that support the x86 (or IA-32) instruction set. This instruction set is equivalent to that of the Pentium Pro, including MMX, SSE, SSE2, and SSE3 instructions. x86_64 CPUs that support the 64-bit x86 (also referred as x64 and AMD64) instruction set. 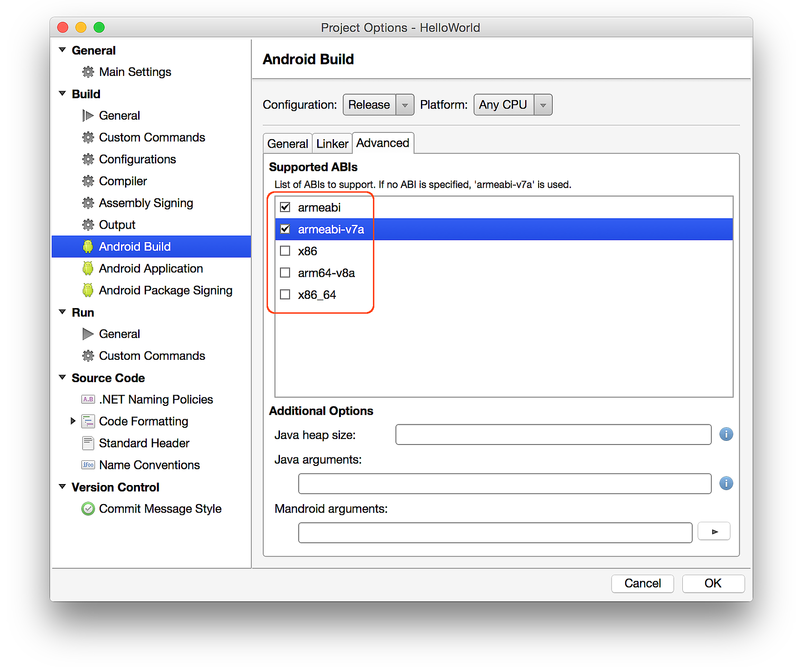 Xamarin.Android defaults to armeabi-v7a for Release builds. This setting provides significantly better performance than armeabi. If you are targeting a 64-bit ARM platform (such as the Nexus 9), select arm64-v8a. If you are deploying your app to an x86 device, select x86. If the target x86 device uses a 64-bit CPU architecture, select x86_64. 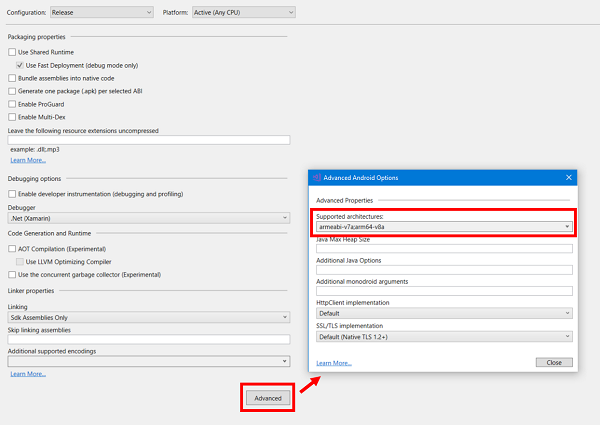 To target multiple CPU architectures, you can select more than one ABI (at the expense of larger APK file size). You can use the Generate one package (.apk) per selected ABI option (described in Set Packaging Properties) to create a separate APK for each supported architecture. You do not have to select arm64-v8a or x86_64 to target 64-bit devices; 64-bit support is not required to run your app on 64-bit hardware. For example, 64-bit ARM devices (such as the Nexus 9) can run apps configured for armeabi-v7a. The primary advantage of enabling 64-bit support is to make it possible for your app to address more memory. 64-bit runtime support is currently an experimental feature. Remember that 64-bit runtimes are not required to run your app on 64-bit devices. In some situations, you may need to create a separate APK for each architecture (to reduce the size of your APK, or because your app has shared libraries that are specific to a particular CPU architecture). For more information about this approach, see Build ABI-Specific APKs.